As a classroom teacher, I was always amazed at the opportunities my students had in the art room. Art was a vital part of the curriculum in the schools I was fortunate enough to work in. Children were given ample opportunities to recreate their life experiences and art was integrated into all areas of the curriculum. Open ended materials were carefully selected and respected as a means of communication. Children had endless opportunities for self expression because of their long term familiarity with the same basic materials; paint, clay, collage, and construction. 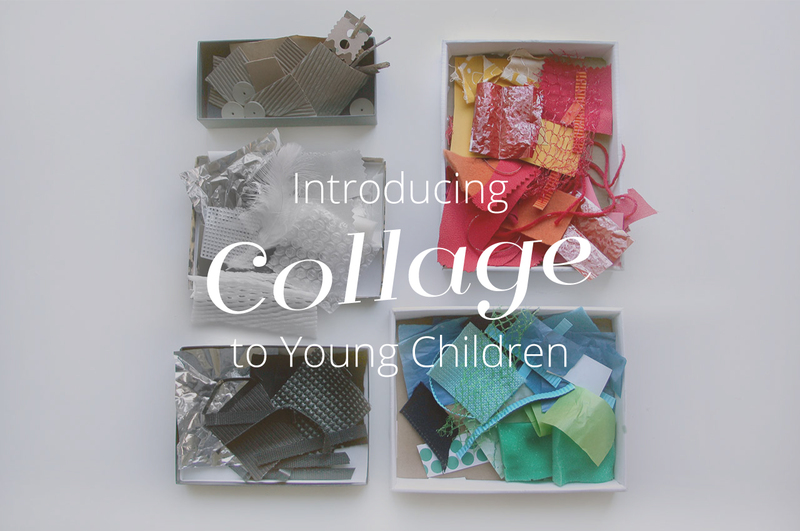 Collage is a wonderful place to start, especially for young children because it nurtures their natural desire to explore the world through their sense of touch. It also allows a certain level of flexibility. 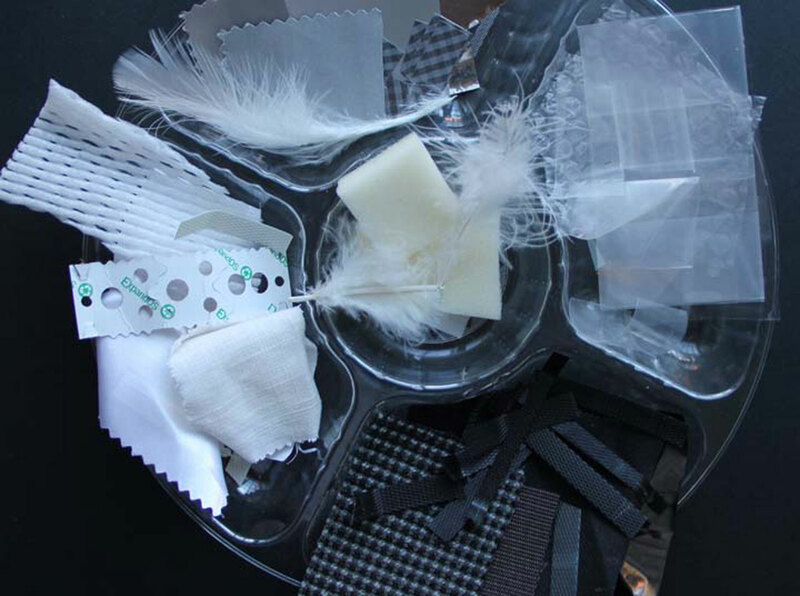 Children can make decisions about which materials to use and can then manipulate these shapes of various textures, forms and color until they are satisfied with their arrangement. Since introducing collage to my children, I notice how much more observant they have become. They are beginning to look closer and notice texture and form out in the world. They see the beauty in ordinary things and can appreciate the possibilities of everyday objects. 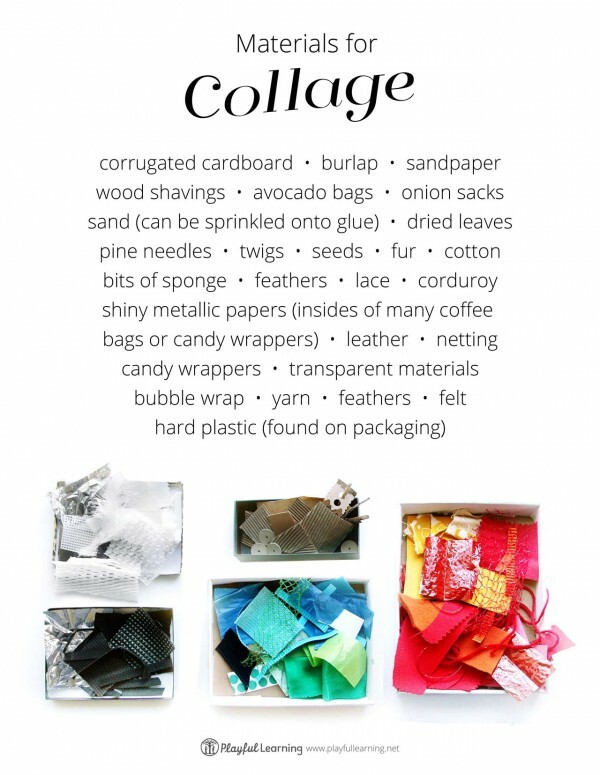 Collage, in its simplest form, is the glueing of materials to a flat surface. The format paper is the background. The size can range anywhere from 7×9 inches for younger children to 14×20 for older. Cardboard or cardstock works best. For the glue, it is recommended to pour the glue in small jars (baby food jars work best) and offer children a small brush to apply the glue. Glue sticks can sometimes get children’s hands too sticky and take away from the tactile experience of the materials. 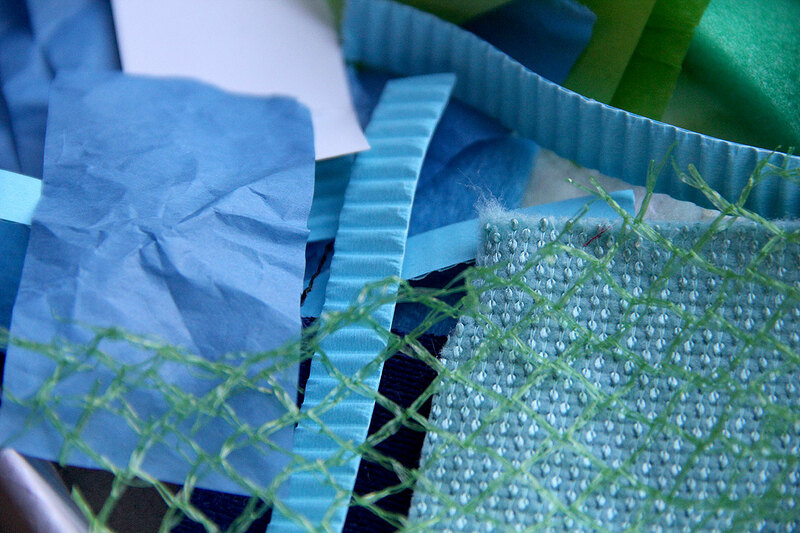 You can begin to collect a wide assortment of beautiful papers and fabrics from just about anywhere. 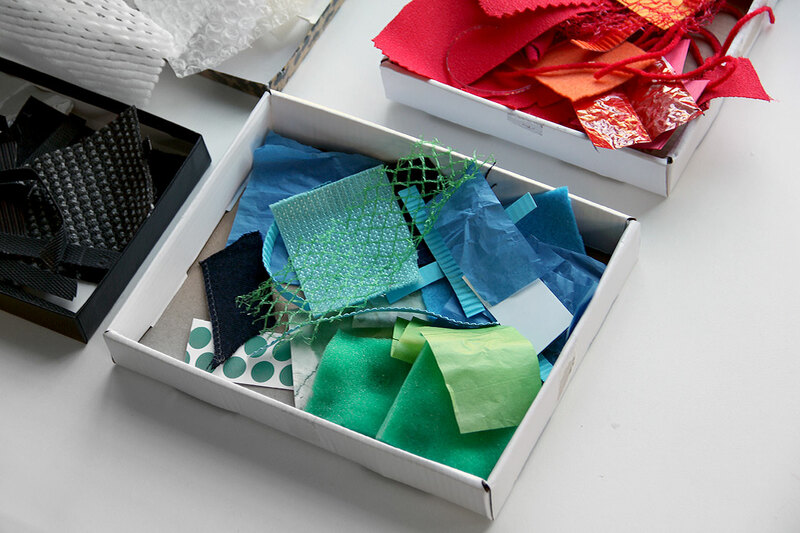 You’ll begin to notice the abundance of texture and color in everyday packaging. I like to look for variety in texture and color. I keep a bin handy in the kitchen so when something catches my eye on the way to the recycling bin, I toss it in. Later, I’ll spend time cutting small shapes from these materials. I also look to fabric from old clothes, swatches from fabric stores, bags etc. Once the materials are precut, it is helpful to sort them in categories. I have sorted my collection of materials by colors, which are then separated into two categories, patterns and solids. I use large ziplock bags and toss them into a big box for easy storage. When I’m ready to present materials, I choose from these bags and place selected materials into trays or shoebox lids. When deciding what materials to put out, the focus can shift from warm colors to cool, shapes that encourage symmetry and repetition, shapes with straight edges, curved edges, softer torn edges, rough textures, smooth textures or any other combination you can think of. When introducing the idea of texture, it is helpful to offer materials in the same color so children can really get a sense of the variation in texture within the same hue. Textures found in nature, such as dried leaves, pine needles, twigs, seeds, etc., are also a great addition to any collection. Setting materials out in an inviting way encourages children to make more thoughtful choices. It is important to give children time to sift through and choose what materials speak to them. This selection process alone is an enjoyable experience for children. I usually give each child a small box or tray to gather the materials they would like to use. When finished selecting, they can return to their workspace and begin to experiment. For younger kids or children just beginning to work with collage, it is important to let go of any expectation. Let them feel and manipulate the textures in their hands. They need time to do this. They may begin then to naturally create a composition or design. They may or may not glue it down. They may glue their hands together and that is ok too. Eventually, they will find their way. There is no need to make something specific. You can guide them towards symbolic representation by asking “How would you use these materials to make a person or an animal?” It is also perfectly wonderful to let them experiment with abstract designs and compositions. 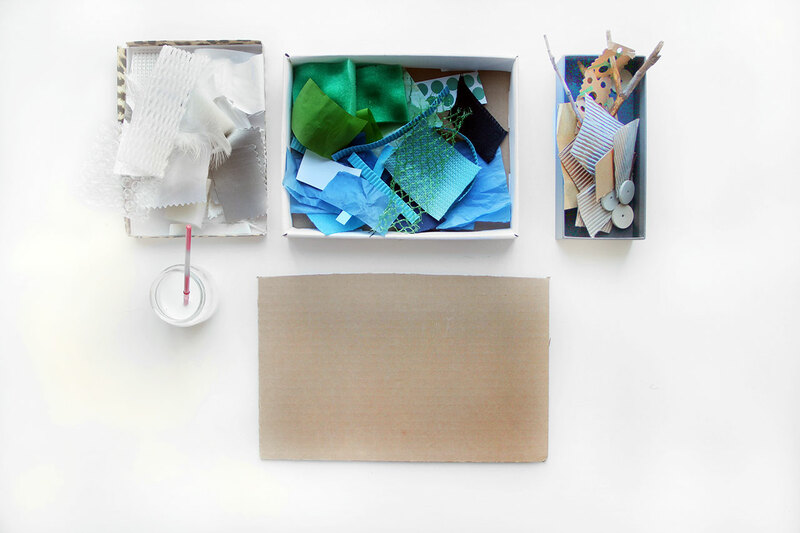 For children that have had more experience with these materials, you can ask open ended questions to encourage them to use this material to share their personal experiences. 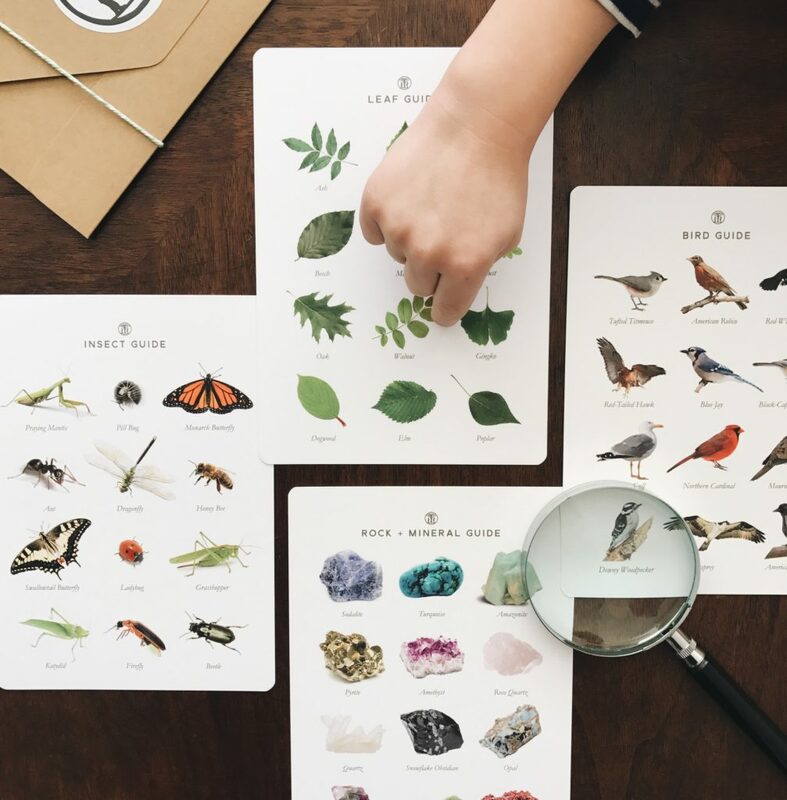 How can you use these materials to show your favorite place outdoors? How can you arrange these materials to show something you like to do with your brother, sister, mother, best friend? Think of a time you played in water, rode a bike, rolled down a hill. Use these materials to show the experience. What do you remember most from our walk through Chinatown? How can you use these materials to show the NYC skyline? What materials would you use to create a portrait of your yourself, your mom, your best friend, an immigrant arriving at Ellis Island. What materials would you use to show the busy streets of NYC or what life was like for Native Americans? 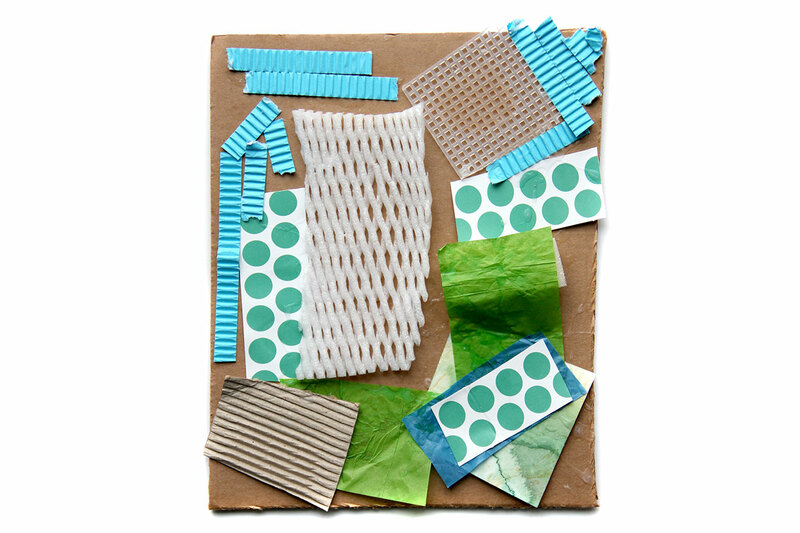 How can you use collage materials to show patterns? 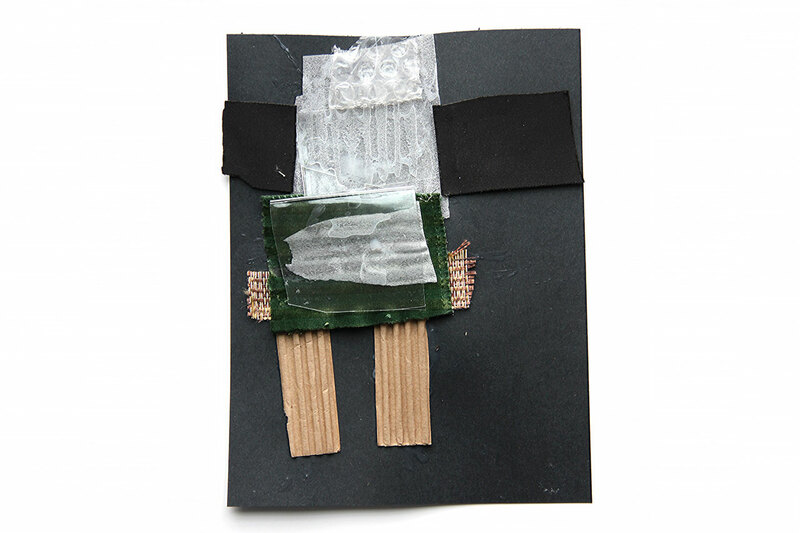 How will you use collage materials to show the main character or setting in your story. Can you use these materials to write you name? So start collecting and have fun!